See the latest data on where to study based on university rankings and the cost of study abroad in the FairFX Study Abroad Cost Calculator. 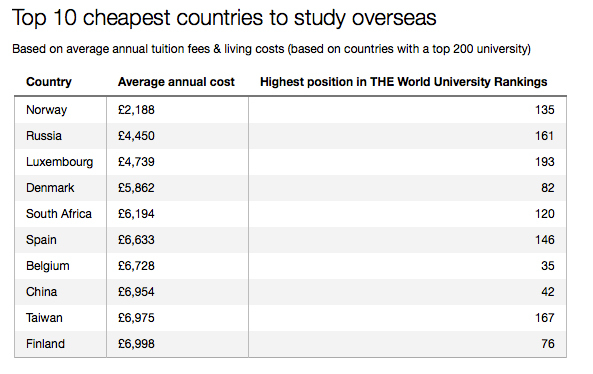 Norway, Russia and Luxembourg take the lead for being the cheapest countries in the world to be a student. Exchange rate trends also reveal New Zealand to offer the best value for money for studying abroad as it’s now 20% cheaper compared with 2 years ago. According to our research, Norway has emerged as being the most affordable nation in the world to be a student with an average annual cost of just £2,188 – based on average annual tuition fees and living costs – in relation to the top 200 universities in the Times Higher Education (THE) World University Rankings. Russia has come second – with a yearly amount of £4,450 – followed by Luxembourg where students will require an average annual amount of £4,739 to get by. With increased tuition fees in the UK – and some universities charging up to £9,000 a year in fees – studying abroad is becoming a much more attractive option as students look to take advantage of lower fees, cheaper living costs, quality of education, as well as favourable exchange rates. The new research has shown the total annual average tuition fees, combined with living costs, in Norway are almost ten times less than that of the UK where students would need an average yearly amount of £21,000. On the whole, the UK was found to be one of the most expensive places to go to university and, out of a list of 28 countries that have a top 200 university, ranked in 24th position, behind only the US, Singapore, South Korea and Australia. In comparison, studying for a year in China or France would cost three times less – in the region of £7,000 – while Brazil (outside of the top 200) would cost just over £8,000 and New Zealand (172 in the top 200) just over £13,000. Our research is similar to that which it conducted in October 2015. However, the latest findings have now been updated to include every country in the THE rankings, which feature 800 universities in 66 countries. He said: “Not only can UK students take advantage of lower tuition fees, but the cost of living can also be much lower so there is a definite financial incentive along with the opportunity to experience a new country and culture. It could become a real alternative to taking a gap year. We also analysed currency trends over the last two years to create a list of which countries now offer more value for money for studying abroad. Topping the study abroad list is New Zealand which is £3,284 cheaper (20 per cent less) than it was two years ago, followed by Japan (£2,747 or 16 per cent cheaper), Sweden (£1,778 or 19 per cent less), and Russia (£1,535 or 26 per cent cheaper). At the bottom of the list are Euro countries at 16 per cent higher, including Germany and Italy which are £1,085 and £1,518 more expensive respectively.